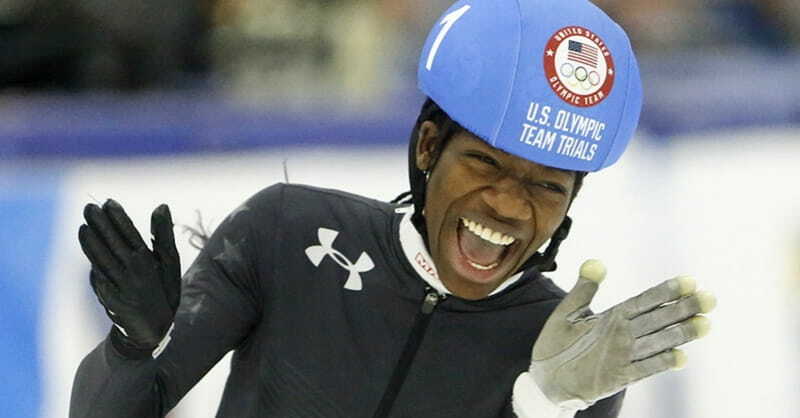 U.S. speedskater Maame Biney, just-turned 18, has a smile that can light up any room, a giggle that has charmed Olympic audiences and a joy that her coaches say has carried her so far in her athletic career at such a young age. Biney already has made history as the first black woman to qualify for a U.S. Olympic speedskating team. Biney was born in Ghana, where her mother and brother still live, and she started skating at age 5 when her dad, Kweku Biney, pointed out a roadside sign for a “learn to skate” event when she first visited him in suburban Washington, D.C. An instructor suggested Biney was too fast for figure skating and should try speedskating instead, according to The Washington Post. With the Olympics in sight, she moved seven months ago to Salt Lake City, where the U.S. national team trains and where she lives with a host family while finishing her senior year of high school. Her breakout came in December at the Olympic trials, when she dominated both 500m races — and cheered so hard after her win that she fell down on the ice laughing. She also thanked her friends, her fellow skaters, her host family, her dad — and God again, for giving her dad the strength to wake up and drive her to practice for years. And she thanked her “church family,” though she didn’t mention to which church or denomination she belongs. “Without your prayers for safe travels and successful competitions I honestly don’t believe that my dad and I would have made it this far,” she wrote. Photo: Maame Biney reacts after winning women's 500-meter A final race during the U.S. Olympic short track speedskating trials Dec. 16, 2017, in Kearns, Utah.